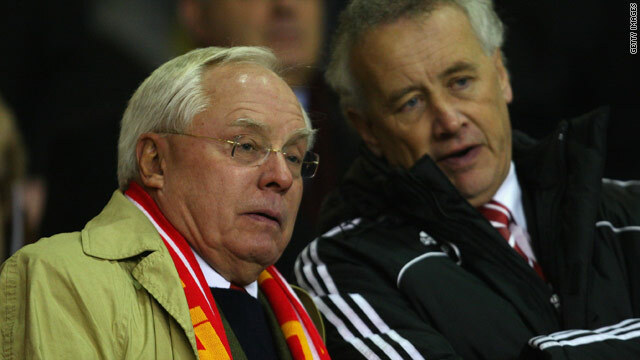 Liverpool co-owner George Gillett, left, with former chief executive Rick Parry, who received a $6 million payoff. (CNN) -- Liverpool's failure to qualify for the Champions League has been put in stark relief by figures showing the English club's American owners made a loss of $81 million for the year up to July 31, 2009. Club accounts released on Friday showed that the losses made by Kop Holdings -- the company set up by co-owners Tom Hicks and George Gillett to purchase the 18-time English champions in 2007 -- increased by $20 million in that period. Tottenham clinched the Premier League's fourth and final place in Europe's top club competition on Wednesday by beating closest rivals Manchester City, a victory that could be worth up to $75 million to the London club. That puts into perspective the situation faced by Hicks and Gillett as they seek to service the debt incurred in buying the club, which climbed from $450 million two years ago to $520 million last year. These figures are at current exchange rates, with the pound now weaker against the dollar than it was in the relevant periods. The accounts reveal the extent to which the U.S. owners have saddled the Merseyside team with debt, with the club itself making a pre-tax loss of $24 million in 2009 following a profit of $15 million the year before. They also revealed that former chief executive Rick Parry was given a golden handshake of $6.3 million when he left Anfield at the end of last season. This deal was agreed with former chairman David Moores while Hicks and Gillett were in talks to buy Liverpool in 2007, according to the UK Press Association, which reported that the sum was the highest paid to a departing British sports administrator. With the American duo actively seeking to sell the club, having brought in British Airways chairman Martin Broughton specifically to achieve that goal, the future of Liverpool team manager Rafael Benitez is also in doubt. The Spaniard, who led Liverpool to Champions League glory in his first season in charge in 2005 and has been linked with a move to Italian club Juventus despite having four years left on his contract, has met with Broughton this week. "It was a frank exchange of views, it was constructive. It was very helpful," Broughton told the Liverpool Web site on Friday. "What I have asked from Rafa is what I think any football club board would ask at the end of the season -- an appraisal of each of the players, where the weak links are, which players he would prefer to sell if he had the opportunity, what players positions he needs to fill, what would be his prime candidates, which are his priorities." The British media has speculated that Benitez will be forced to sell key players such as Spanish top scorer Fernando Torres and England midfielder Steven Gerrard. Torres has been linked with a $100 million move to Premier League leaders Chelsea, the club that Broughton has supported all his life, but the chairman said Benitez did not need to offload any players. "There's absolutely no reason to sell either Torres or Gerrard. I don't want to sell either of them; Rafa doesn't want to sell either of them," Broughton said. "The club is not looking to sell either of those. We don't need to do it to pay off any debt."